STEPHEN PADDOCK was an American mass murderer who allegedly fired with automatic weapons into a crowd of some 22,000 concert-goers at a country music festival on the Las Vegas Strip on October 1, 2017. 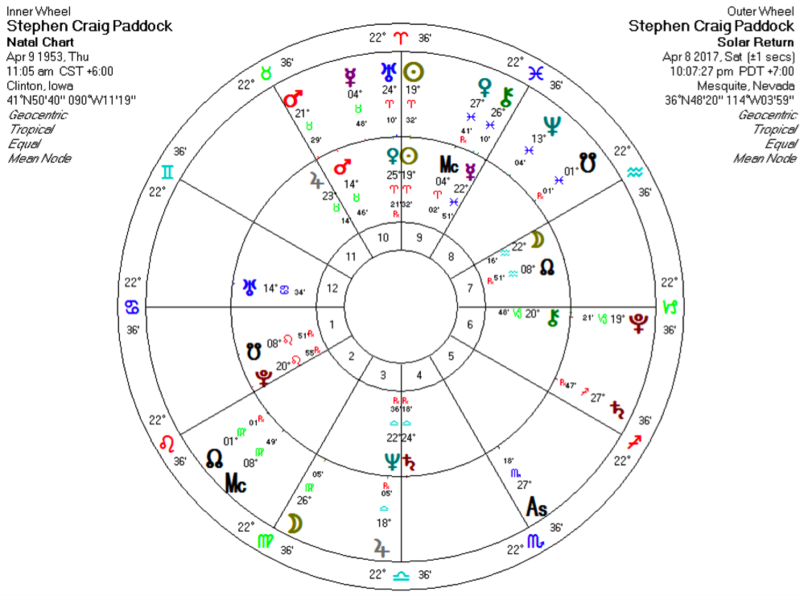 Shortly after the shocking massacre from Las Vegas in 2017, I became curious to analyze Stephan Paddock’s natal chart, trying to comprehend his inner world and see how his outer manifestation has changed over time, slowly taking him in the direction of deep hatred towards others. I expected to find in his natal chart strong elements that would’ve pointed to some possible reasoning behind his atrocious actions. Moreover, I expected to find strong earth elements since he prepared everything with such meticulously and well-calculated manner. Nevertheless, I even expected to find missing fire elements, just like in the charts of other criminals. Such missing elements would’ve indicated that he likely wanted to show power and authority in his own sense and definition. 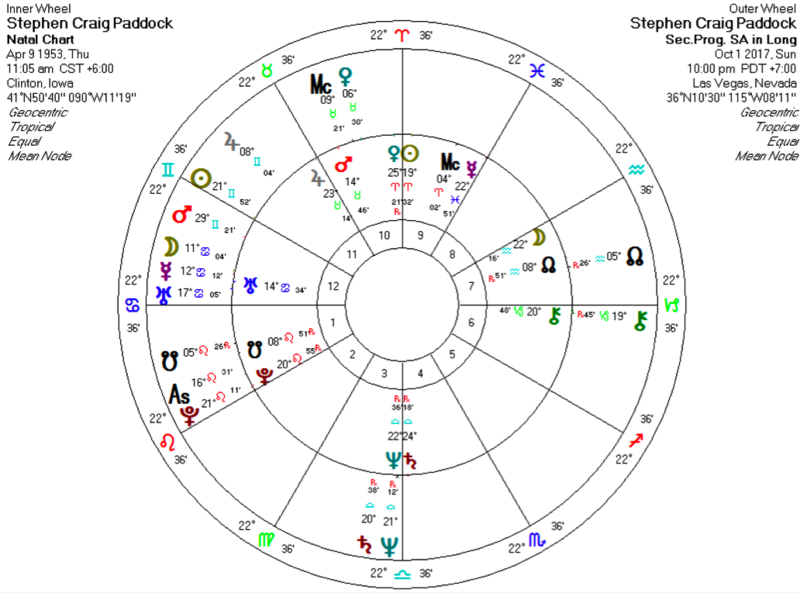 In general, Paddock’s natal chart shows that he liked to support and nurture others. This likely gave him a way of self-expression. Also, in general, relationships with other people may have played an important role throughout his life as they could have set up eventual new beginnings for him. Moreover, he may have been sensitive to the feelings of his partner, even if he was often moody, inflexible, or detached. His life partners may have aided him to extend in some way his limits and emotions, perhaps helping him to become emotionally detached from others. However, Stephan Paddock was likely inflexible, especially when it came to his habits, actions, and belief system. Also, it seems, he liked routines, while handling pressure very well. Moreover, the natal chart shows a natural capability to organize things, to initiate, to instigate and to inspire others. He could have easily adopted thoughts and ideas, but it seems he was stubborn and had a well-defined way of doing things. Paddock was born under Waning Phase/ Last Quarter Moon Type (Moon from 90˚-45˚ degree behind the Sun). Those born with the Moon 90°- 45° behind the Sun believe in definite systems of thought and/or concrete institutions. Also, he likely had good timing, knowing when it’s the best time to act. Those born during the waning period of the Moon are said to be fundamentally objective, oriented towards passing on their experience to others, or sowing the seeds for the future. 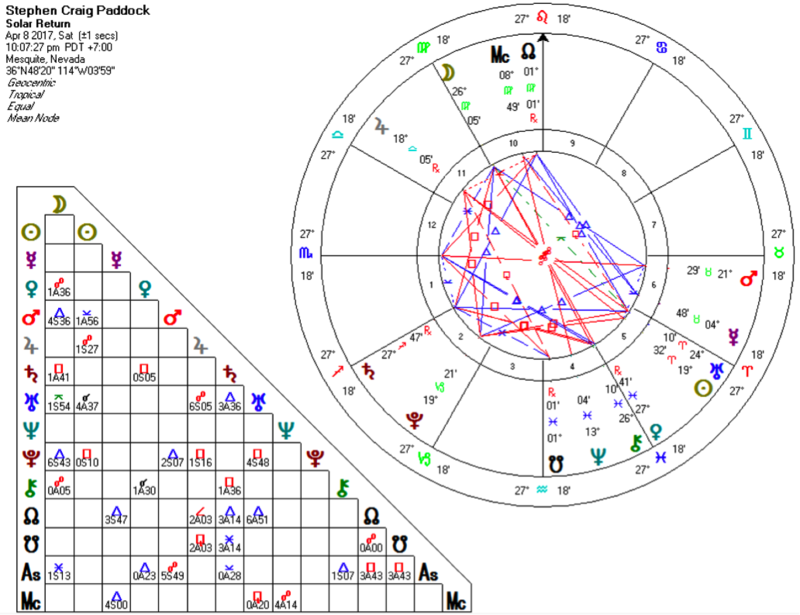 As a general view, Paddock’s natal chart is quite well balanced and at a first look, nothing seems to emphasize his violent actions. Despite this, looking deeply into his natal astrological configurations we can easy spot several patterns: fixed T-Square, cardinal T-squares, Yod, Minor Grand Trine, and Mystic Rectangle; in some of them we have the same planets involved, symbolically emphasizing the way he perceived the outside world and the way he manifested his intentions. If we deeply analyze each of them and watch when the transits pass through those important points, we will understand when and how the outside world has influenced and disturbed his inner pace. However, the planning behind his mass crime did not happen overnight, making it important to analyze in detail at least the last year of his life. As I have found in many cases, the year previous to criminal activity highlights a “seed” or “root” of the individual’s actions and also showing the criminal’s deep secrets. Practically, it unfolds the criminal’s deep secrets. Exterior circumstances affecting the individual can also be determined. 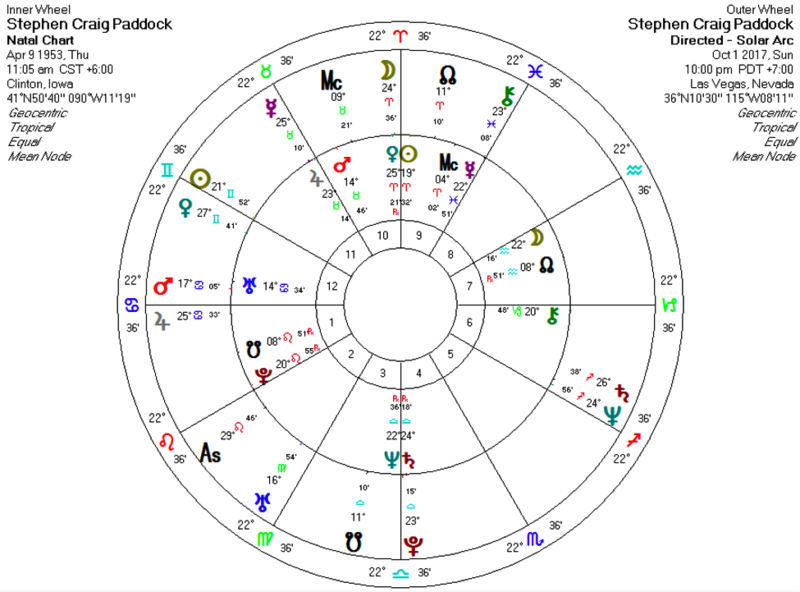 I have analyzed Stephan Paddock’s last year of life from 4 different astrological methods that I will explain briefly down here in this article. Also, I have included the chart required for each method. The Solar Return usually shows the inner quality of the year; therefore it’s a very important method that must be taken into consideration. Paddock’s solar return has a Scorpio Ascendant, showing an intense and wary outlook for the 2017. During this period there was an intense sense of self-expression and image, rich emotions, reconnection with old elements and rebirth of old memories. It was a time of projecting himself with dignity. Moreover, the Solar Chart indicates that he may have surrounded himself with loyal, trusted allies. Mars and Pluto, the chart rulers, together with the Moon, are part of an earth Grand Trine, involving the 2nd 6th and 10th houses, ruling money, everyday routine, and public manifestation. This pattern indicates a high degree of harmony, enjoyment, and contentment. So what he did around April 9, 2017, he did with passion, with precision, and loyalty. The three planetary principles (Pluto, Mars, and Moon) brought together can produce a natural talent that enables a high degree of achievement with a relatively low degree of effort. More then that, the Solar Return Chart shows another two pattern aspects: a mutual T-Square and a cardinal T-Square. Both configurations emphasize issues and inner tensions around self-expression, public manifestation and money. (Moon opposite Venus, both squares Saturn, involving the 10th– 5th and 2nd houses. Also, Jupiter opposite Uranus, both squares Pluto, involving 11th – 5th and 2nd houses). The Solar Return Midheaven is in Virgo, showing meticulous planning and attention to detail regarding public image and the pursuit of life goals. His public manifestation during 2017 was expressed through practical or craft-base work. 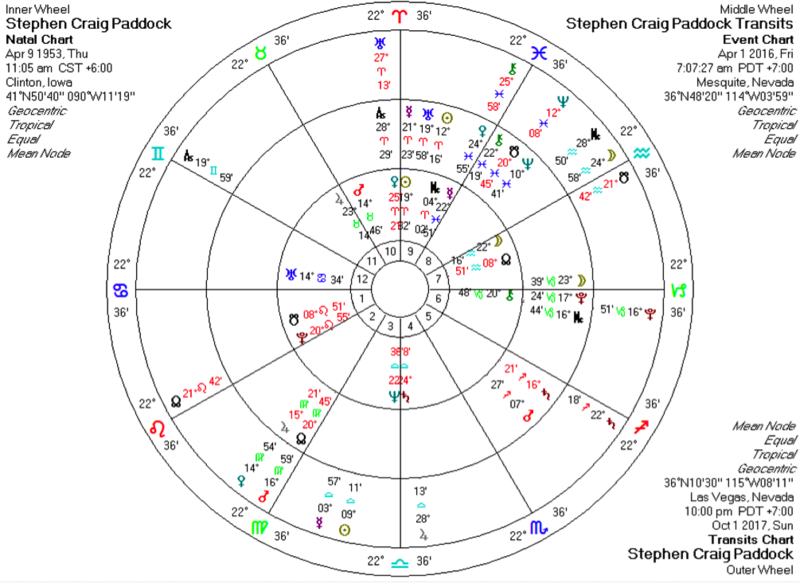 Going forward the Solar Chart shows some conflict in terms of feelings and emotions between his meticulous habits and life partner, between his public and private life, and his memories and his intimate relationships. However, the chart shows several aspects that may indicate a hard time to deal with restrictions, especially limits that could come from the financial zone, including financial obligations. This could affect the relationship with his life partner or with other people from his public life (Saturn square both Moon and Venus). What is very interesting is that, if we look at the solar return chart and natal chart we see that Uranus is near his natal Venus. This indicates a major change during 2017 that may come suddenly in connection with his lover, associates, changes that could break some old patterns. Also, Pluto falls over his natal Chiron, which is conjunct Descendent (wounds, injuries to others, death and total transformation). Secondary Progressions are also felt more personally and at a deeper level, offering details about the inner landscape and indicating psychological changes that may be not obvious to others. Therefore, an analysis of Stephan Paddock’s progressions should shed some light on his deeper inner processes and motivation during 2017 and may bring us closer to an area of expansion and psychological change. The progressed Ascendant is Leo and thus the chart ruler is the Sun, located in the last degree of the 11th house and conjunction the cusp of the natal twelfth. So this year was the beginning of a new stage in his personal development. The progressed Moon, Mercury, and Mars are also in the 12th house, emphasizing the zone of his preoccupations. The eleventh house is associated with plans in connection to others, group ideals, and international friends, while the twelfth house is associated with secrets, activities behind the scenes, hidden places, the desire to retreat or escape. His natal Sun is located in the 9th house, which is the house of belief system, philosophy of life, politics, others cultures and law. So he seems to have a natural interest in what was going on in the world, and 2017 emphasized hidden activities and activities in connection to others. Moreover, 2017 emphasizes a long period of issues related to secret activities and with people from his secret inner circle deeply influencing him. Therefore, he may have been part of some idealistic group or organization. Or he may have been involved in secret activities that gave him an important role and status. So it seems he recharged his energy from mysterious places or activities, from mysterious sources in general. All in all, the progression confirms that he could’ve changed the way he felt and saw the World. So he may have changed the perception about people in general, too. He also could have become more reclusive, and thus felt weaker with life goals that were unclear. The transits show that a new skill was required that would redefine him or regenerate his ideas about life and death in general. However, at the same time he could have activated his subconscious; the way he connected emotionally with others, perhaps the way he nurtured and protect them (especially his mother). In other words, he could have brought forth elements from his past, perhaps reopened his deep memories related to relationships (transiting North Node conjunction natal Pluto and transiting South Node conjunction natal Moon, emphasizing the first and seven house). 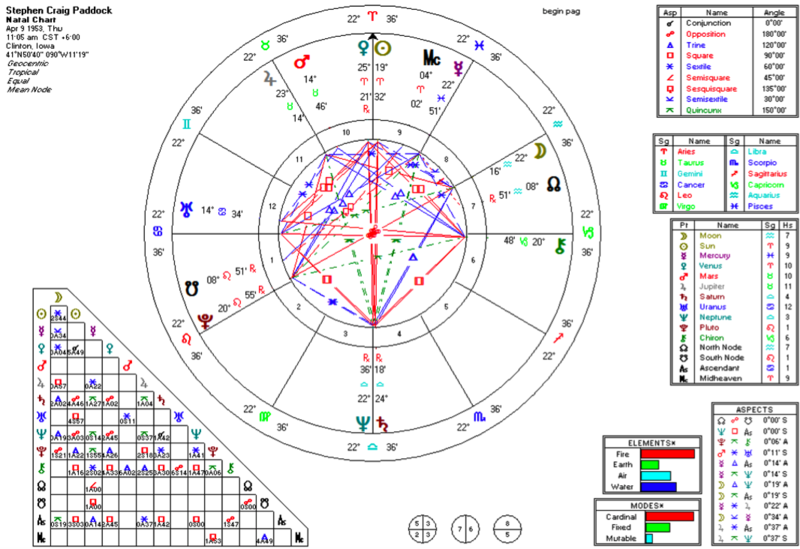 The transit chart shows that starting with the middle of March 2016 he may have enhanced his higher mind and started to gradually change his life principles and belief system (including religious and politic views), his perception about other countries, and his philosophical world view. Uranus in the 9th house is the enemy of seeing the world in rigid ways, so certain circumstances could also occur and he could feel that he cannot fit into the old boundaries. So, this transit could require some adjustment. He also could have been attracted to a new way of thinking. Therefore his individuality may have been affected by some external events. The resulting changes could have contradicted his identity, even his early life principles, structures of his country, principles or rules (law) (Uranus during his transits opposite natal Saturn, fourth house). Starting with the middle of June 2016 it seems like he was forced to make many changes. However, the changes he may have made during this time seem to be in contradiction with his big ideals and the principles from his earlier life. So his life structures seem to have been more than ever challenged. He may have gone back and forth with new ideas, some that with eventually bring changes. Beginning in April 2017 he may have reconnected with these elements or people, contributing directly to his identity change, his attitude towards life, and his role in public life. What is interesting is that in March and April 2017 he could have begun experiencing distance in relationships, especially with his life partner (Uranus transiting his natal Venus). At this time Uranus was transiting his 10th house, which could indicate the possibility of his reputation and status in world being changed as well, possibly a reason to break free. Transiting Uranus opposites natal Neptune may indicate confusion in terms of religion, spirituality, and belief system. So this aspect may indicate sudden changes in his big ideals, and the probability of becoming involved with people out of touch with reality, even people who use drugs and alcohol. Here we can observe direct Pluto to conjunction natal Saturn indicating a high potential for great difficulties and loss as well as oppressive dealings with others. A powerful external factor may have restricted his life and nevertheless determined him to change his life principles. Pluto shows control, over power, dark secrets, while Saturn shows limits and strong principles, sometimes the end of the road or even a father figure. However, direct Pluto was in the fourth house of parents and home environment. Therefore, some issues from childhood, especially relating with his father, could reemerge during this time, and perhaps he began to comprehend their consequences in his life. More than that, direct Pluto conjunct his natal Neptune, which may have complicated his reality, his spirituality, and beliefs. In other words he may have felt an exterior pressure that could’ve pushed him to transform his ideology. In the Solar Arc Direction, direct Chiron conjunct his natal Mercury, in the 9th house. It’s possible that he had long distance travels especially in the last year and a half with the purpose to cure certain wounds that could come from others /from early age. In addition to all of the above, the Lunar Phases have a very important role at an emotional level, especially if a New Moon or a Full Moon will trigger a natal planet. Needs and priorities could change. In the last year, since April 2016 Steve Paddock had many natal planets triggered by a new Moon, a full Moon and even by a Lunar Eclipse. I will enumerate several days that could’ve had some particular impact on him (it could be on or around these days). A general idea for the type of violent action he later committed may have taken shape around April 7, 2016, when the New Moon (18˚04”Aries) fell over his natal Sun (19˚32” Aries). He may have had an ambitious new beginning, an exciting and courageous plan of fighting. Then, on May 6, 2016, he might have had an opportunity, an open way to material security and loyalty. Or, he may have acquired some tools that offered him personal security and comfort such as money, new weapons or meet a loyal person. The New Moon (16˚41” Taurus) from May 6, was near his natal Mars (14˚56” Taurus) indicating some fast and precise actions that could have stimulated his personal interest. On July 4, 2016, he might have suddenly changed his habits and emotional expression. So, something from his environment, a person he met, or an experience could have triggered a major emotional switch. He may have been impulsive and he could have become unpredictable. The New Moon (12˚54”Cancer) fell over his natal Uranus (14˚56”Cancer). Around August 2, 2016, he may have reconnected with someone or something from his past. This could have deep meaning for him while also being a contradiction with his future life path. During this time he could have accessed a memory about his father or discovered some old aspects of his roots, family life, elements that may have had a strong impact on him in the past. The New Moon (10˚58” Leo) fell over his natal South Node (8˚50”), and also opposite his natal North Node (8˚50”). During or around September 16, 2016, it’s possible he received a message that affected him in some way and changed his mood. He could have become overwhelmed. The Full Moon Lunar Eclipse (24˚20” Pisces) was near his natal Mercury (22˚51”). Around October 16, 2016, he could have his thoughts on his relationship, and the emotions he experienced around that time could have emphasized difficulties in terms of his early environment, life principles, and even father image. He could have acted promptly and courageous to finalize some things. The Full Moon (23˚ 14” Aries) was near his Venus (25˚ 21” Aries) and opposite his natal Saturn (24˚18” Libra). November 14, 2016, – Full Moon (22˚38” Taurus) was near his natal Jupiter (23˚14 Taurus”). This could be the day of a practical conclusion, it could have opened for him some solid opportunities, a possibility to see and comprehend the world in another dimension, differently than before. One of the very important days, February 11, 2017, when the Full Moon Lunar Eclipse (22˚28” Leo) was conjunct his natal Pluto (22˚55”). This could have been a very intense time for him and he could have discovered deep elements about his character and he transformed his perception of life and after life. His ideas focus on power and authority, so he could have had a profound personal experience that transformed his soul, resetting his identity in the world. On March 12, 2017, the Full Moon (22˚13” Virgo) opposite his natal Mercury, emphasizing a message or news about some of his beliefs or ideals. April 11, 2017, the Full Moon (21˚ 33” Libra) was near his natal Neptune (22˚36”Libra). This day may have brought confusion, even deception, and give continuity to some of his dreams. So, he seemed to have at this time a mature vision about what he wanted to do. Libra is the sign of collaboration, the sign of Venus, and in his natal chart Venus is retrograde, located in the 10th house. It’s about relationships, about love and affection, about public manifestation, about art and artistic zone. To conclude, he seemed to have opened wounds relating to others. Also, there are several astrological indicators that show confusion when he felt limits. Moreover, it’s possible he used alcohol or drugs, especially when his big dream seemed not to be well synchronized with his reality. What is very interesting is that his chart seems to indicate that his death may remain a mystery.